Our children's birth plates are the ultimate keepsake gift for celebrating a newborn's arrival, for a 1st birthday gift, or for a religious celebration. Made by hand in the USA, each plate measures 7 1/2 inches across and comes kiln fired for permanency in your choice of three exclusive designs. 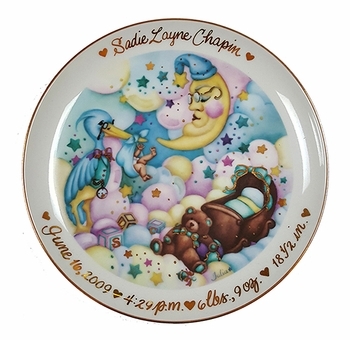 Plates are personalized with name, birth date and time, length and weight. Additionally, you may include a custom message on the back of the plate. Painted in gold, your message to the child may be up to 65 characters in length. Your gift arrives in a decorative gift box embellished with ribbon. You also have the option to include a decorative twisted brass plate stand with your order as a lovely display choice. Click on "MORE IMAGES" above to see all 3 available designs and more. Processing Time 5-7 business days. Does not include shipping time.